I hope everyone is gearing up for a fun weekend with lots of entertaining plans. My son returned Friday. 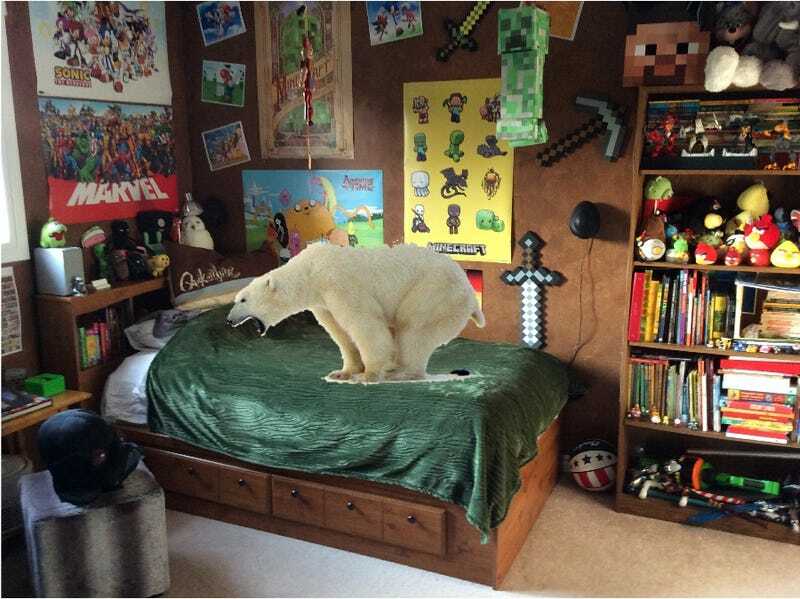 Last week, I sent him the photo above telling him he needed to come home since the bears had moved in to his room and were starting to make a mess. He thought it was hilarious. Poop jokes...always good for the 8 year olds. He had a great time while away and came home with Splatoon for WiiU and Super Smash Bros. for the 3DS, so there will be more games in the house for Dad to play. Last week was the second week that my son was away at my parent’s house. You’d think I would have continued to game, binge on TV series, and generally party as my wife and I had done the week prior, but alas that did not happen. We decided to reorganize and re-evaluate most of the stuff in the house while the kid wasn’t around to distract us. We ended up taking tons of bags and boxes of clothes, baby toys, and small appliances bought on impulse to Goodwill for donation. We also ended up with three large bags of garbage and 8 recycle bins full of stuff. It was a very productive purge of the house and we gained a ton of extra storage space in the process. I realized that I am a T-Shirt hoarder. I must have over 500 video game and concert T-shirts. A bunch don’t fit anymore (or never did), though thanks to the TAY Run Club I should be able to fit comfortably into a lot more of them. I’m still going to hoard them though, the ones that don’t fit will fit my son sooner or later. I hope “vintage” video game t-shirts will thrill him when he is older. What I didn’t do last week was play much in the way of video games. We became obsessed about reorganizing the house and then I realized I had to put everything back in order for my parent’s visit as they dropped the boy back home. I haven’t even read any TAY all week, so that’s my first priority for the weekend. It is a shame too. The engine is rather solid and the performance is great. The sound design in the game was exceptionally well done, especially all the bullets whizzing around in 7.1 surround sound. Control-wise, the game works well and everything seems like it should be in place for a great game. The big problem with Resistance 2 is that it is just boring. The combat is dull and repetitive (I played on difficult/hard). The AI isn’t very thrilling and there are numerous occasions that kill you instantly until you learn where the insta-kills are coming from. Most of the bosses are just awful (though visually amazing). I’m not sure I’ve played a game with such terrible bosses in recent memory. Half of the major bosses are killed indirectly; you hardly fire a shot at them. It can be fun to mix up the traditional “boss fight” but generally it just comes off as a big letdown not being able to actually fight the boss itself. The final boss is simply ridiculous. This is the evil dude that killed people as you watched and is supposed to be the “big threat” in the game. In the end, you get to spend a really long time watching him rip rooms apart, not having to even move out of the way (or move at all). Then you shoot several machines at the climax and that kills him. To make matters worse, this battle is probably the easiest part of the whole game. You don’t fire ONE SINGLE SHOT at the final boss. For a game all about shooting things, I don’t know how this snoozefest sequence made it past planning. I was very disappointed with the game and so glad it is out of the way. It makes me a little leery about playing Resistance 3, but many have said the third game is a little better and I really have to play it just for the Sharpshooter support. After such disappointment, I decided Resistance 2 lowered the bar enough that I could play NeverDead for 360. I’ve read so much bad press on NeverDead that I was almost afraid to play it, having bought it solely on my past love for many of Rebellion’s games. I’ve only had a single session with NeverDead, but so far it certainly isn’t terrible and seems to actually be a fair bit of fun; though I realize that a root canal would seem fun after Resistance 2. The look of the game is great, but I really wish it was on PC since the framerate chugs at times and I’d love a higher resolution. If anything, it is at least novel and feels like something I haven’t played before. It definitely has cool destructible environments and I love the way they’ve implemented a double crosshair for the dual wielding. The lead character is voiced by David Lodge who has an impressive list of video game credits and does a great job of channeling Ron Pearlman’s Hellboy. Hopefully after my guests have departed this weekend I’ll have a chance to sit down with more NeverDead and develop a better opinion of the game. My wife and I still have to polish off the Dante’s Inferno DLC and since the kid is back I imagine Splatoon and hopefully Halo 3 ODST are in my near future.